Now, I'm sure you are aware of this folklore or superstition from the south that eating black-eyed peas on New Year's day will bring you good luck for the coming year. And it's usually in the form of a dish called Hoppin' John; but I wanted to make something that was a little fresher and lighter. So as the story goes...you should eat one black-eyed pea for each day of the year. The peas represent coins, the collards represent green money, and the cornbread represents gold, (which I decided not to make because I want to eat healthy). Also, for additional good luck you are supposed to place a coin under the pot while cooking the black-eyed peas and a coin under each dinner plate while eating. Well, I forgot this part and so hopefully, counting out the peas has us covered for the entire year. I was not born and raised in the south. I grew up in Maryland which is considered a boarder state, but I did grow up eating black-eyed peas and collard greens. However, I never quite understood why everyone cooks the crap out the peas, as well as the collards. Most recipes call for cooking the peas for 1-1/2 hours and for braising the collards for that amount of time as well. I do not find eating mushy beans/peas or army green collards very appealing and so this is a really quick and healthy dish that can be made in 30 minutes. 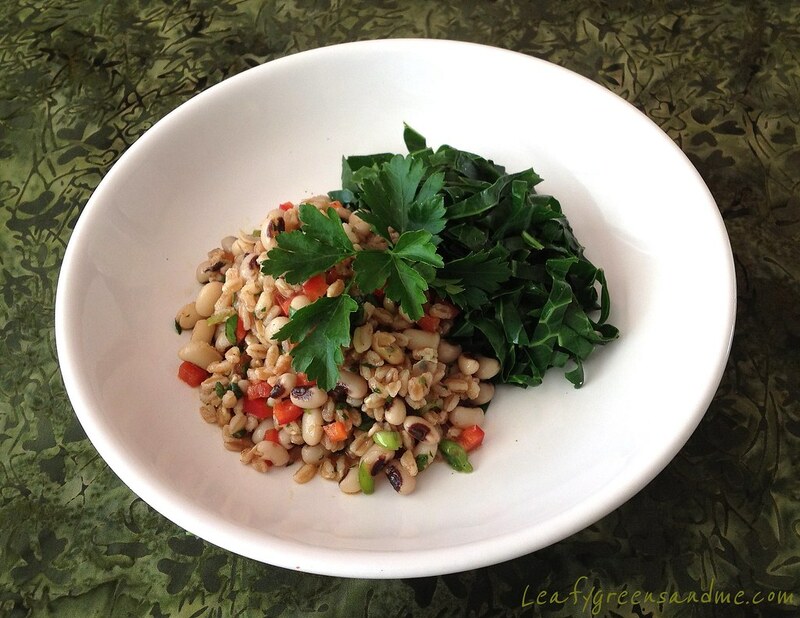 Unfortunately, New Year's day has come and gone, but you can still get all the health benefits from eating black-eyed peas, farro and collards anytime, and that is what's really important! For the organic collard greens, I sliced them into thin ribbons, rinsed them and steamed them for about 1 minute until bright green. I then tossed them with a little lemon juice and sea salt and black pepper. Just delish and so healthy!! !